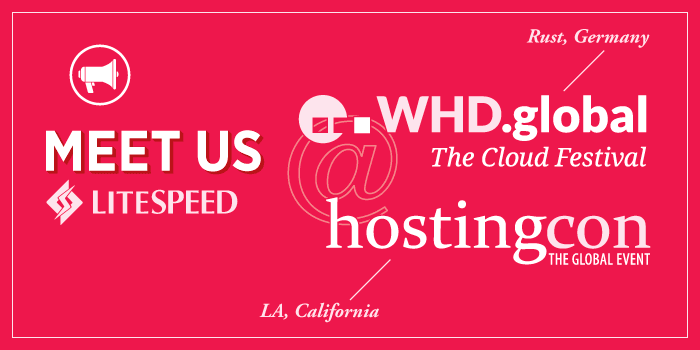 LiteSpeed Blog / Products / LiteMage Cache / Meet Us at WHD.global and HostingCon Global! We are going for a trip around the world! At the end of March, we will be leaving our office in New Jersey, USA, to fly all the way to Rust, Germany, to attend WHD.global in Europa-Park. The second we get back from WHD.global, we will be on the next flight to Los Angeles, California, for HostingCon Global. We would love to personally invite each and every one of you to come visit us at both/either of these wonderful events! As platinum members at WHD.global, we get the opportunity to offer you free access to the event. To take advantage of this, register with our code (GL17RAZ). This free access includes admission for the whole event including entrance to the main.FORUM, hosting.SESSIONs and hosting.FAIR, catered lunch, and much, much more. For more information about WHD.global, please visit the WHD.global website. We will also be giving an industry insight talk titled “Building High-Availability, Cache-Accelerated Cloud Hosting Platforms” on Tuesday, March 28th, in the Cinema 4D theater at 12:45 PM. Come learn all about how we are committed to building the highest performing software stacks for shared, VPS, cloud and dedicated hosting platforms. Before leaving WHD.Global, make sure to visit our booth, F04, to find out what we can do for you! HostingCon Global, in LA, offers a variety of networking and educational events designed to help boost success and grow businesses. We would love to speak with you about how we can help you and your business, so come visit us at booth 511! If you would like to learn more about HostingCon, please visit the HostingCon Global website. Whether you just accidentally stumbled upon this blog or you are long term fans of us here at LiteSpeed, here is a little summary of what’s new here this year! Since you’ve last seen us, our cache offerings have matured and can now support a growing array of application specific accelerations. We have released new and updated plugins that increase both caching and acceleration performance for WordPress, XenForo, and Magento. The Cache Solutions we provide, LiteSpeed Cache and LiteMage, guarantee the best experience with caching: easy management and unbeatable speed. They just work, and they work really well. Our new Web ADC, a 100% software solution, will run anywhere – private dedicated hardware, hosted environments, clouds, etc. Out of the box, LiteSpeed WebADC offers cutting edge features like High-Availability, HTTP/2, PageSpeed Optimization, Cache Acceleration for Magento, WordPress, Xenforo, and more. LiteSpeed WebADC should be your top candidate for building a highly available, cache accelerated, DDoS resisting hosting platform. We look forward to meeting all of you in Rust, Germany, and Los Angeles, California. If you have any questions, comments, or concerns, please do not hesitate to ask!